At Interhampers, we know the importance of showing your clients and staff how much they're appreciated. When it comes to corporate gifting solutions, Interhampers have got you covered in more ways than one. Whether you are looking for a premium corporate gift for an important client or a gift basket to reward your employees, our range available at interhampers.com.au caters for all. From traditional gift baskets packed full of your favourite treats to contemporary gift boxes and chests with top shelf spirits and quality wines, interhampers.com.au has the corporate hamper for every occasion and budget. For those searching for a stand-out corporate gift, our range includes a luxurious range of travel bags, insulated picnic and cooler bags, designer faux leather padded chests and more! All filled to the brim with delectable goodies sure to delight any recipient. Interhampers Australia are proud to celebrate 29 years as the market leader in corporate gift hampers. We are geared to support our corporate clientele and have been entrusted with the gift requirements of some of Australia’s best known companies. We truly make gift giving easy with Australia wide delivery so browse our range today and let us take care of your corporate gift requirements at Christmas or anytime throughout the year! ← Some of our loyal corporate customers we supply to. Need to order multiple hampers, all going to different locations? At Interhampers.com.au our unique ordering system allows you to add a different address and message for every hamper in your shopping cart, making it as easy as possible to send lots of personalised hampers in the one order! Sending a huge amount of hampers everywhere in Australia? Save yourself hours of time by simply cutting and pasting your order details into our Bulk Order Form and uploading it straight into our system - it could not be easier! 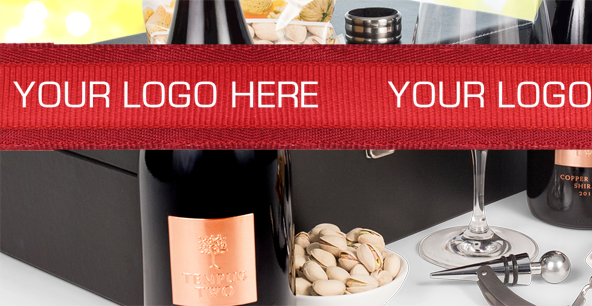 Interhampers also offer branded ribbon to be attached to our gift hampers. Printed with your company logo in your company colours, branded ribbons remains our most popular corporate branding options. Send a personal message to your clients or staff with our custom-ordered gift cards. Professionally printed with your company logo and customised message onto your chosen gift card design. The cards are then attached to your chosen hampers and promptly shipped straight to the lucky recipients! ← Gift card options we provide. (Minimum order quantity applies). Please contact our office for further details on corporate branding. A family-owned Australian company, Interhampers boasts a state of the art facility that produces over ONE MILLION gift hampers every year! We are HACCP approved and are the stand-out industry leaders in our quality, production and safety standards. Our experienced team is made up of valued, long serving and loyal staff members who are more like our extended family members and who contribute diligently towards our day to day operations. With a strong focus on customer service, we ensure that all our customers, large and small, are treated as if they were our only customer and we go above and beyond to guarantee the best service and care possible. Interhampers Australia guarantees quality, value and service. We are always available to help you find the perfect gift for your friends, family, associates, colleagues and valued clients. We believe that an Interhampers Gift Hamper is your answer to making gift giving easy!